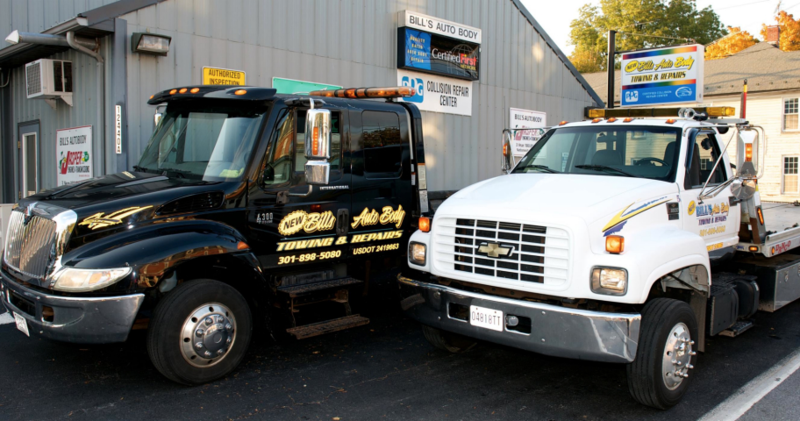 New Bill’s Autobody has 3 full service tow trucks available 24 hours a day, 7 days a week to provide our Thurmont & Frederick County, Maryland customers with a variety of services. Our Thurmont MD towing company services include towing, flat tire changes, lock outs and dead batteries. Two of our trucks are equipped with flat beds and can handle the heavier types of vehicles. All of our drivers are trained and knowledgeable in towing any vehicle. We work with local law enforcement agencies to remove or recover vehicles that have been involved in accidents. Give us a call at 301-898-5080 for trusted, professional 24/7 towing! They do outstanding work for a cheap price! Employees are willing to go the extra mile to please their customers. Would recommend to any friends or family who need car work! Best auto body shop in the area. Price is right and work is outstanding. Friendly staff aims to please. This is the second time I've had my car repaired by Bill's Auto Body. The service is fast, efficient, and very well done. My car looks brand new. Not only did they do an amazing job on the repairs, but they also detailed the card inside and out before I picked it up. I highly recommend them! My vehicle was rear ended about two months ago. I contacted my insurance company to report a claim. They recommended I use Mike's Auto. I had my vehicle towed there that same night. I went the next day to get several belongings out of my vehicle. I spoke with Mike (owner) and asked him if my vehicle was totaled. (It was pretty close to being totaled). He laughed and said it was no where near being totaled, and it was only about 5,000 worth of damage. I used to work at a car dealership, I know how a body shop works. They don't want it to be totaled, no money in their pocket. I immediately called Bill's Auto Body and had my vehicle removed from Mike's and towed to Bill's. They did an estimate for 10,545.43. And it only needs to be 11,500 to be totaled. So YES, it was in fact very close to being totaled. Bill's called me almost every day to update me on my vehicle's status. They are wonderful! They were the only towing company able to help us out in the middle of the night (1am) after an accident. The driver was incredibly polite and professional. Prices are fair and typically covered by insurance anyway. At New Bill’s Auto Body we will offer you the best service at the best price. From the simplest mechanical job to the most detailed, your vehicle will look and run it’s very best.